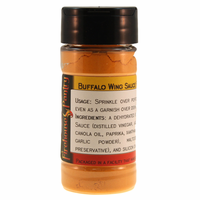 Product Details: Use Buffalo Wing Sauce Powder just the same as you would the liquid buffalo wing sauce, or sprinkle over popcorn, use in meat rubs, or even as a garnish over dishes such as deviled eggs! 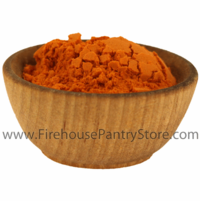 A bright red powder that provides excellent hot sauce and butter flavor. The sauce is made from select, aged cayenne peppers that provide a rich, red, flavorful hot sauce to which butter flavor is added. The finished sauce has outstanding flavor and aroma with a moderate heat level. The sauce is then spray-dried into a powder that can be used in applications where a liquid sauce won't work. The dry powder is shelf-stable; no refrigeration required; great for emergency food supplies, camping, RVing, boating, and hiking. Ingredients: A Dehydrated Blend of FRANK'S RedHot Buffalo Wing Sauce (Distilled Vinegar, Aged Cayenne Red Peppers, Salt, Water, Canola Oil, Paprika, Xanthan Gum, Natural Butter Type Flavor, and Garlic Powder), Maltodextrin, Rosemary Extract (as a preservative), and Silicon Dioxide. Packaged in a facility that also handles wheat, milk, soy, egg, sesame, peanuts, and tree nuts. We use this to make our: Bleu Buffalo Dip Mix and our Buffalo Blue Cheese Popcorn Seasoning.